distribution Strictly the southeastern portion of the state -- the southern 35-40% of the Coastal Plain in particular. It ranges north to Moore, Sampson, and Jones counties. These counties represent the northeastern end of the range of this Southeastern species. abundance Formerly (prior to about 1995), it was uncommon; however, there are no more recent records, despite considerable searching (often by canoe and kayak) in the proper season (fall). Thus, as of now, the species is rare at best. Without doubt it has strongly declined, but the reasons are not clear. flight One of the very few "autumn-only" dragonflies in NC, though technically it begins it flight in August. The flight in the state occurs between mid-August and mid-October, peaking in late September and early October. habitat Sandy creeks or small rivers, where waters are clean. behavior Males typically forage in fields or clearings, perching conspicuously. They patrol over streams in a slow manner, often with some hovering. comments This is a dragonfly that likely can be identified in flight over water, owing to the glowing bright yellow or golden-yellow club, and the fairly late flight period. 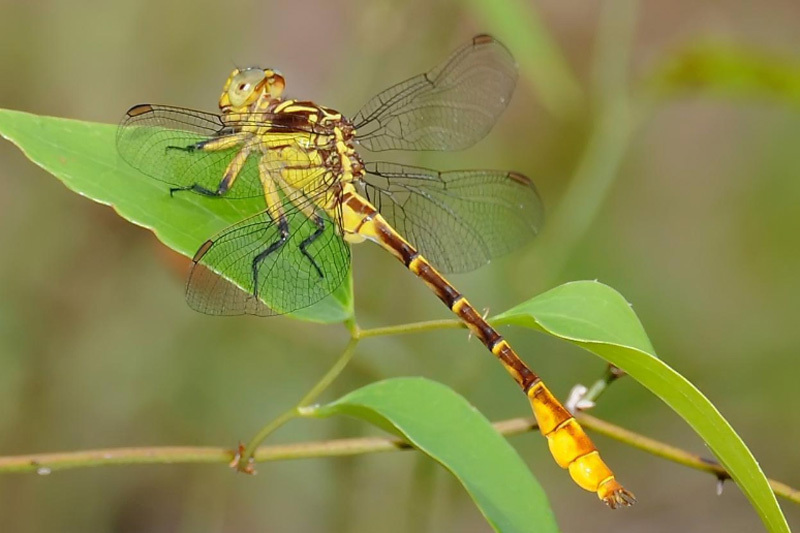 The more numerous Russet-tipped Clubtail has a more orange/red club. Several observers, especially Mark Shields, have specifically searched for the species from 2016-2018, with no luck. Thus, the absence of any records since the early 1990s, for a readily identified species, is alarming and almost certainly indicates a clear decline in the state. At least, there are several recent records from the SC Coastal Plain, where the species is obviously less rare than in NC. Odonate enthusiasts are now "trekking" to nearby sites in SC to see this species for the first time; at least, that gives them experience with the species and what to look for (habitats, behavior, etc.) in NC.